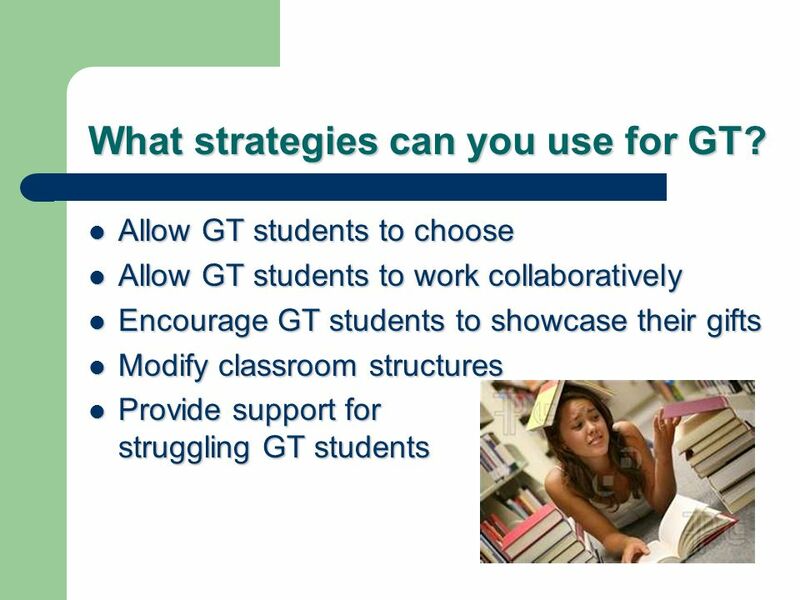 AP Strategies for the GT Student S. Petrey LISD August Staff Development. 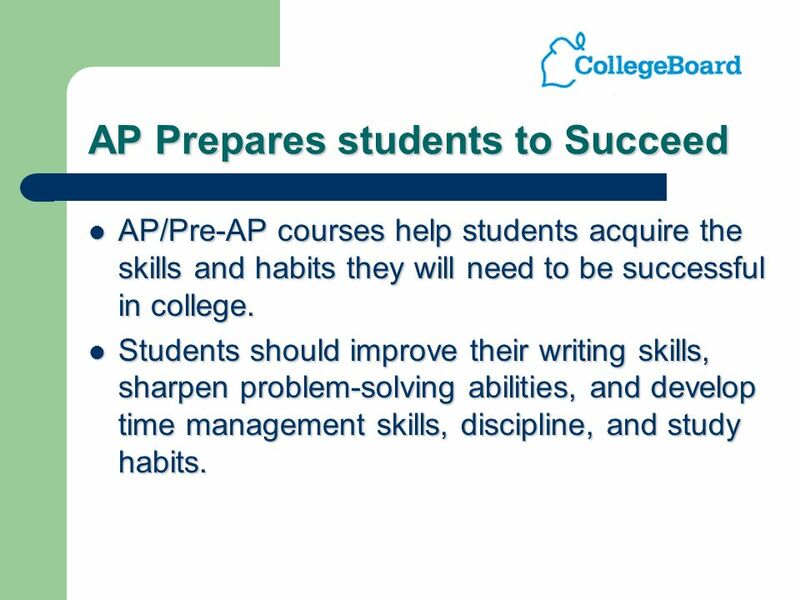 2 AP Prepares students to Succeed AP/Pre-AP courses help students acquire the skills and habits they will need to be successful in college. 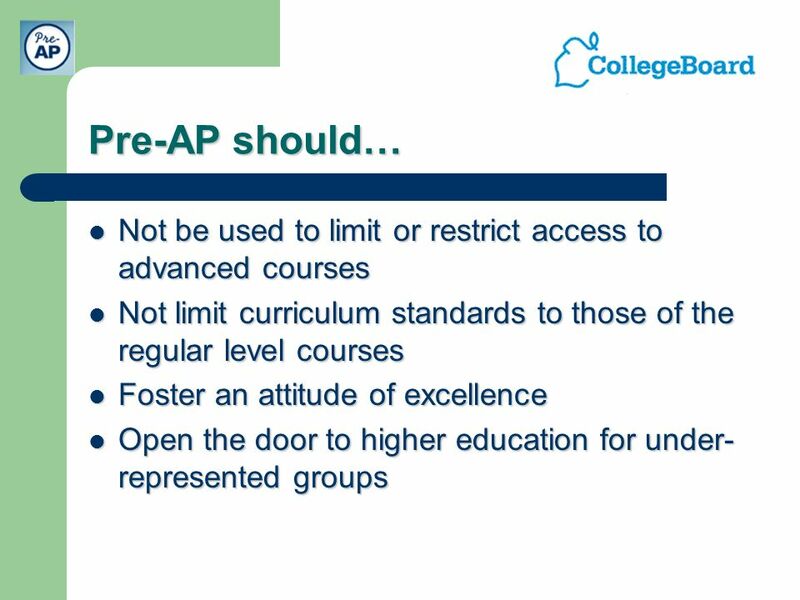 AP/Pre-AP courses help students acquire the skills and habits they will need to be successful in college. Students should improve their writing skills, sharpen problem-solving abilities, and develop time management skills, discipline, and study habits. Students should improve their writing skills, sharpen problem-solving abilities, and develop time management skills, discipline, and study habits. 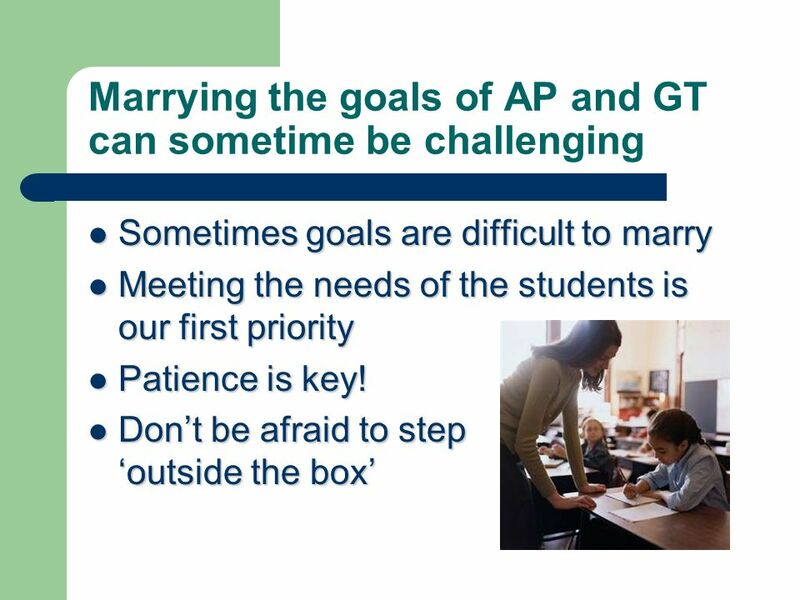 3 Pre-AP is based on the following two important premises The first is the expectation that all students can perform well at rigorous academic levels. 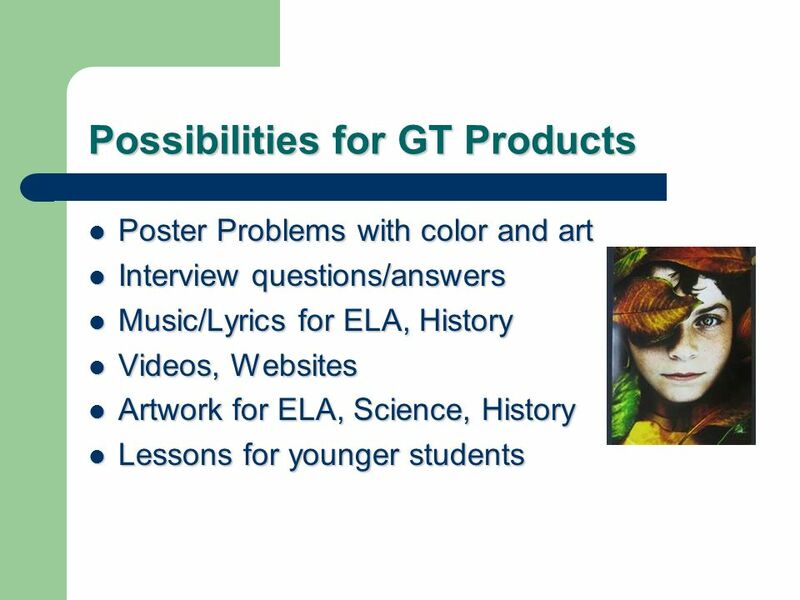 The first is the expectation that all students can perform well at rigorous academic levels. The second important premise of Pre-AP is the belief that we can prepare every student for higher intellectual engagement by starting the development of skills and acquisition of knowledge as early as possible. The second important premise of Pre-AP is the belief that we can prepare every student for higher intellectual engagement by starting the development of skills and acquisition of knowledge as early as possible. 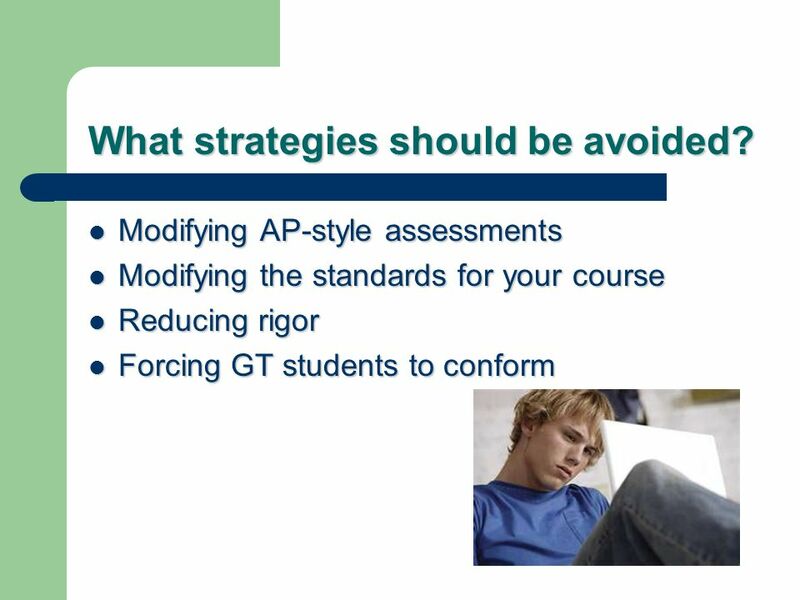 7 What can you do to teach a viable AP or Pre-AP Course? Provide rigorous work that requires students to do independent research, writing, and problem- solving Provide rigorous work that requires students to do independent research, writing, and problem- solving Foster an attitude of excellence Foster an attitude of excellence Use released AP Exam questions as models for your assessment items Use released AP Exam questions as models for your assessment items Familiarize yourself with the AP Course description and sample syllabi for your corresponding AP course(s). 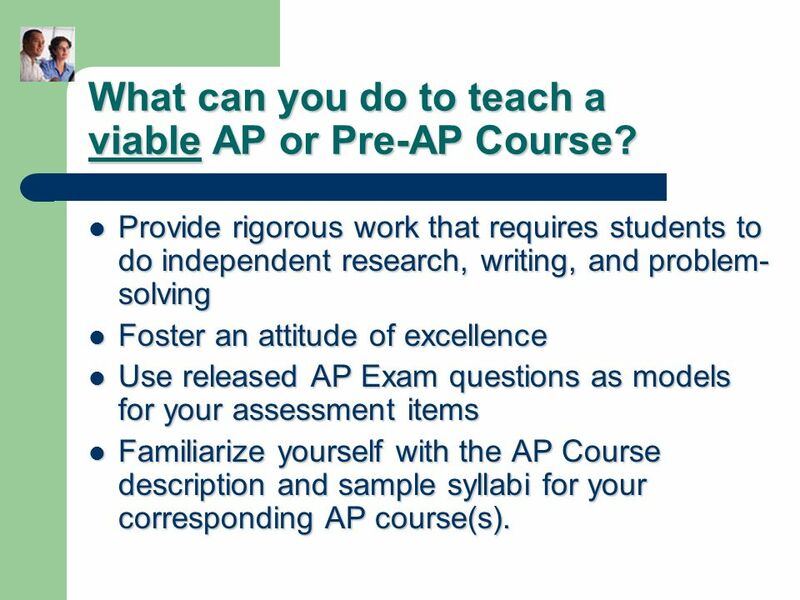 Familiarize yourself with the AP Course description and sample syllabi for your corresponding AP course(s). 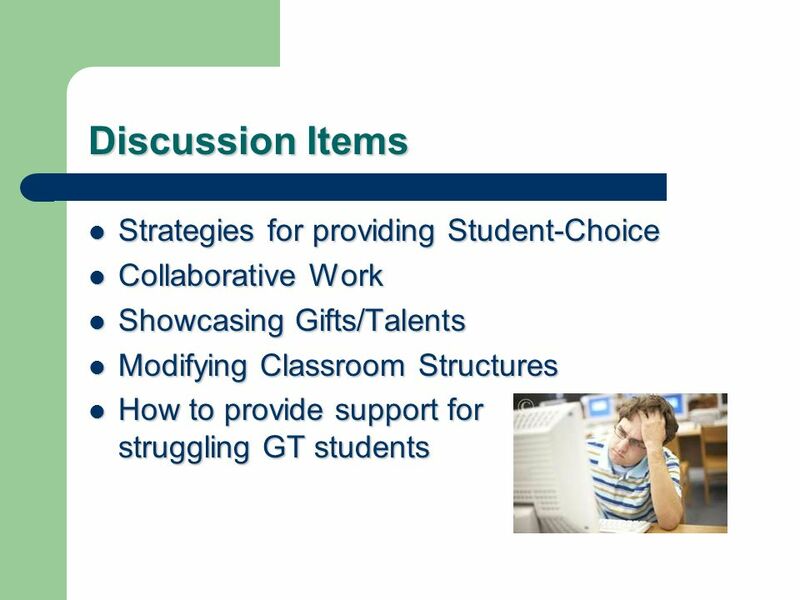 8 How can we address GT students specifically? 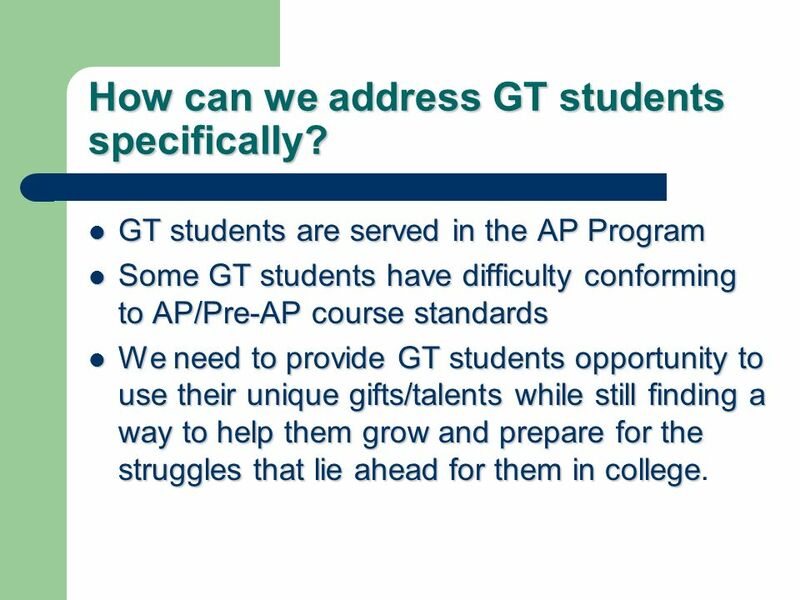 GT students are served in the AP Program GT students are served in the AP Program Some GT students have difficulty conforming to AP/Pre-AP course standards Some GT students have difficulty conforming to AP/Pre-AP course standards We need to provide GT students opportunity to use their unique gifts/talents while still finding a way to help them grow and prepare for the struggles that lie ahead for them in college We need to provide GT students opportunity to use their unique gifts/talents while still finding a way to help them grow and prepare for the struggles that lie ahead for them in college. 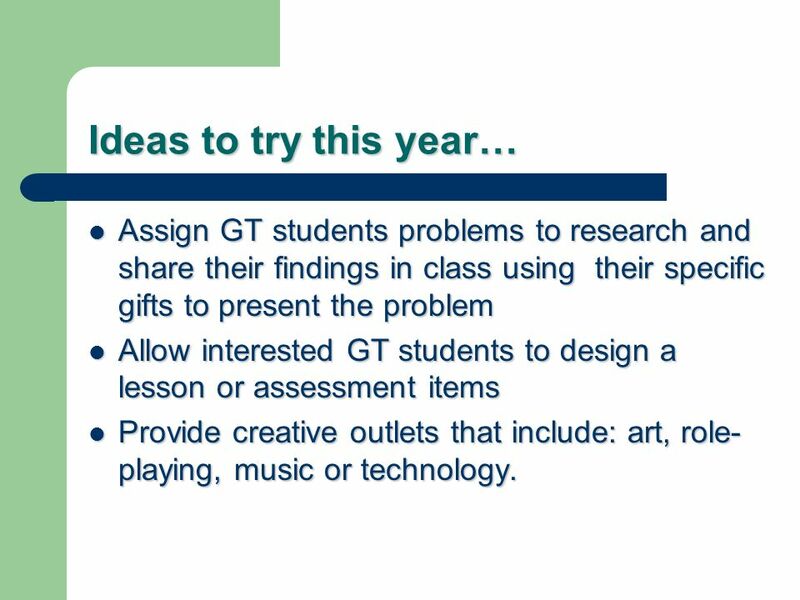 11 Ideas to try this year… Assign GT students problems to research and share their findings in class using their specific gifts to present the problem Assign GT students problems to research and share their findings in class using their specific gifts to present the problem Allow interested GT students to design a lesson or assessment items Allow interested GT students to design a lesson or assessment items Provide creative outlets that include: art, role- playing, music or technology. Provide creative outlets that include: art, role- playing, music or technology. 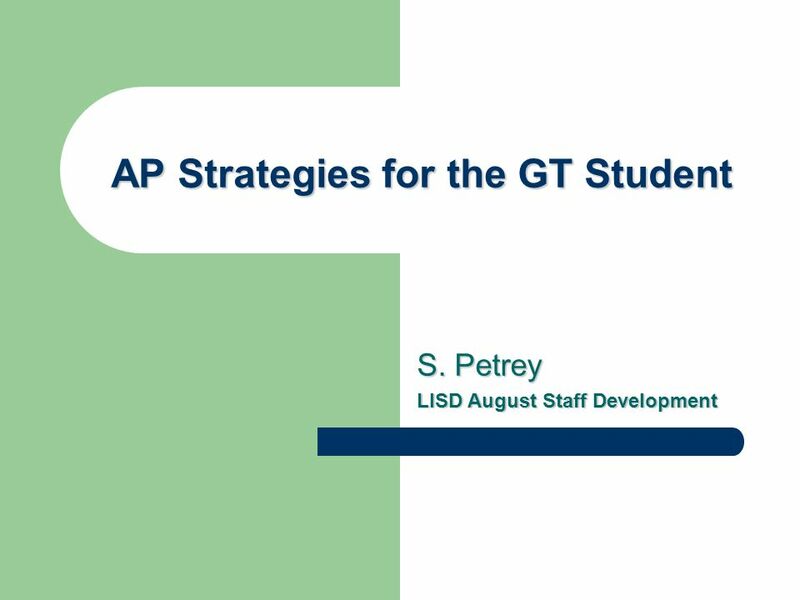 Download ppt "AP Strategies for the GT Student S. Petrey LISD August Staff Development." o Nearly all 50 states have adopted the Common Core State Standards and Essential Standards. o State-led and developed Common Core Standards for K-12. 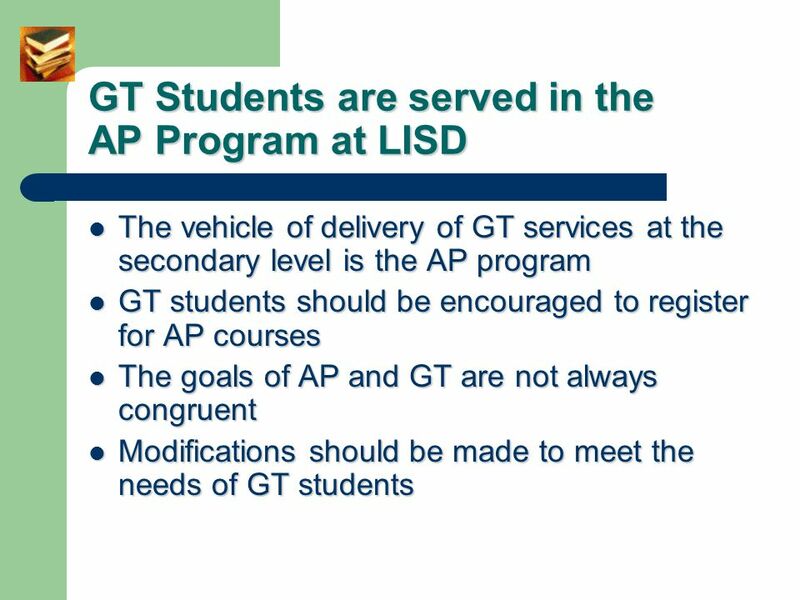 CollegeBoard AP The AP ® Program. What is the difference between Advanced Placement ® and other college–prep or honors courses ? Designed by teams of. Unraveling Pre-AP,GT and AP Course Selection CHHS counseling Department 2012. Welcome Parents!. Learning Immersion and Talent Development Magnet Programs K-5 Barringer Academic Center Idlewild Elementary Irwin Academic Center Mallard. 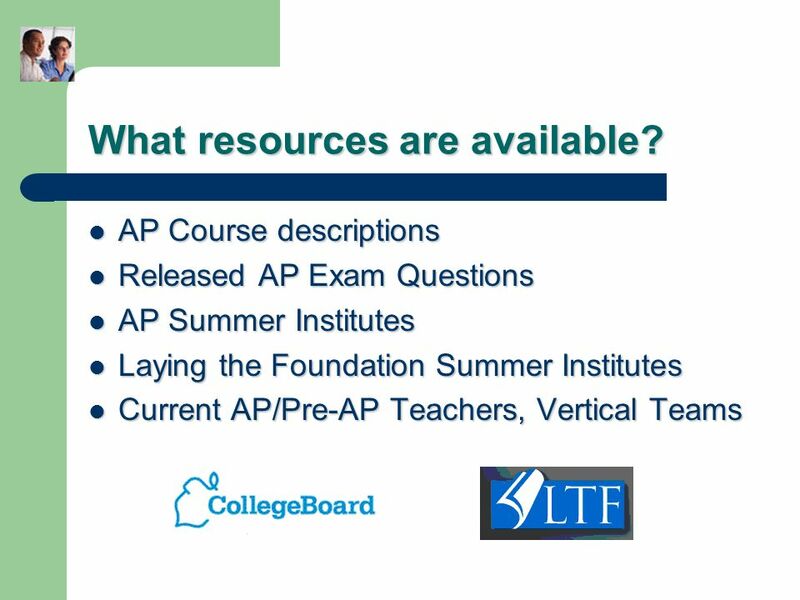  What is Advanced Placement?  What is the International Baccalaureate?  How are they different and alike?  How do the Honors programs fit in?  What. MYP (Middle Years Programme).  m7oU. Chandler Unified School District CATS Program Chandler Academically Talented Students. Effingham County Who is a Gifted Student? A student who demonstrates a high degree of intellectual and/or creative ability, exhibits an exceptionally.  What is giftedness?  What is talented?  Are these two terms synonymous? Middle School Talent Development Program at Northwest School of the Arts Janice Bernier Academic Facilitator. Effingham County 2007-2008. Who is a Gifted Student? A student who demonstrates a high degree of intellectual and/or creative ability, exhibits an exceptionally.